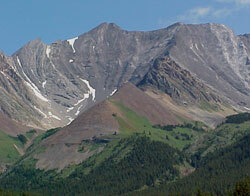 This Storm Mountain is located in the Misty Range, the highest and most spectacular group of front-range mountains in the southern Rockies. 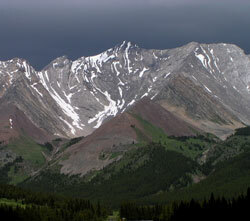 The mountain is said to have been named by George Dawson in 1884 after numerous storm clouds were seen on its summit. There are actually two Storm Mountains, only 100 kms apart and both are said to have been named by George Dawson in the same year and for the same reason. An additional coincidence is that they are within five metres of each other in elevation. 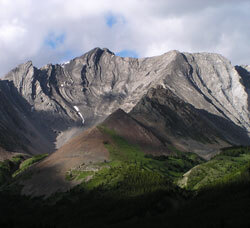 The other Storm Mountain is in the Vermillion Pass area of Banff and Radium National Park.